The story was very scary, but the music was nice. This made me laugh out loud :D Cute! Cute. Could work better with some sort of overlay effect. In infofile you forgot "Programmed by:". Sweet demos are also made of this. Bad 4k's are made of this. unwatchable thanks to crazy dan resolution. evidently this is a good thing. after elephants the soldiers are now marching on... looks to childish for me. Looking forward for the conclusion of this epic trilogy (i hope it's at least a trilogy). 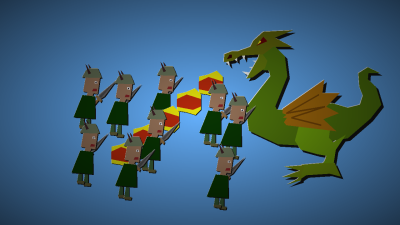 Will the villagers defeat the dragon or are dragons going to be the superior overlords of this legendary world? I can't wait to find out. What, never commented on this? DRM FTW! page created in 0.015705 seconds with 15 queries.